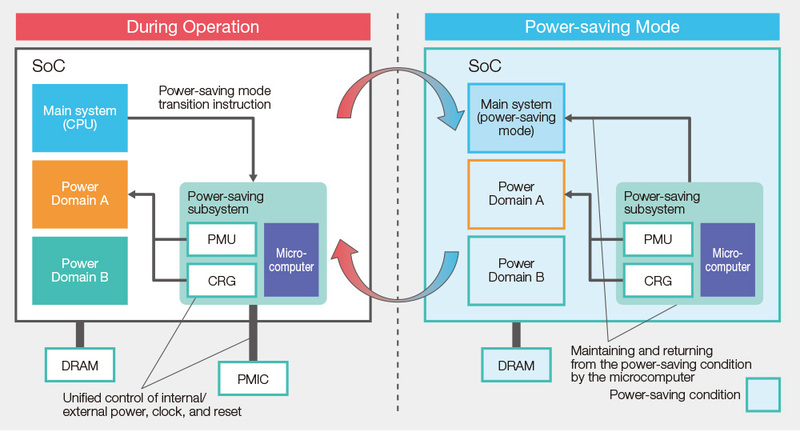 Power-saving Subsystem | Socionext Inc. In step with SoCs becoming more functional and highly integrated recently, providing a power-saving mode has become an absolute essential. For example, network standby mode keeps the minimum required interfaces, mainly network functions, awake and places the remaining functions in standby to save power. Sleep mode keeps only subsystems awake to make the system enter a deeper sleep, and there are various ways to implement power-saving mode. We provide a power-saving system to satisfy such needs. A power-saving subsystem is composed of an Arm microcomputer, minimum required peripheral IP, RAM, and others, and operates separately from the main system. By doing so, this subsystem allows you to achieve the following functions. We offer the following support services that make it easy to introduce the subsystem. Network standby response is a function in which the subsystem carries out packet processing on behalf of the main system when it is in a standby state. This function also supports the following functions.